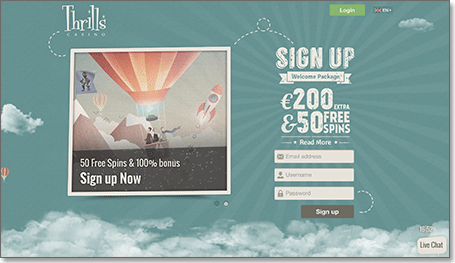 Thrills Casino is making good inroads in the industry since coming online in 2014. CasinoSites.com.au’s Brad McGrath was lucky enough to get the chance to talk with Thrills’ affiliate manager Erik Hedberg about how the casino came about, what they have planned and just why their brand is so different to the competition. Personally, what is your role at Thrills Casino? How did you end up working in online casinos? Is gambling something you’re passionate about? Yes, I have always been passionate about gambling, ever since my grandmother taught me how to play cards when I was a little kid. I started working in the Brick and Mortar casinos back home, and when the online boom came I was quick on jump on, and I have been working with online casinos since 2006. Has the industry changed much in the last five years? Or even two years? Yes and at a very rapid pace. We have seen a change in the way online operators work. Five years ago there was a lot fewer options for players who wanted to try their luck on online pokies, and it was hard to separate the serious operators from the shady ones. Today we have come a long way in terms safer and more transparent casinos. Also the experience for the player is much improved, with more generous offerings, more and better games etc. Today it is not enough just to open the doors and expect players to come, you must provide an excellent casino with great and secure service. Where have been the growth areas? The growth on a global scale has slowed down a little compared to the pace it was 5-7 years ago in terms of relative growth. What is happening now is that more and more markets are moving their offline betting to the more convenient online vertical. As the quality of online and especially mobile products are being improved we will keep seeing a shift in this direction. Thrills has won awards for being innovative, is this something that your team prides itself on? Your games are powered by Net Entertainment, did a lot of thought go into this? The safe option would be Microgaming, but you chose a younger company? We actually took the easy way out and decided not to choose, so we implemented them both and many more. We understand that different players prefer different games so we picked the best game from several game providers and integrated them all in our casino lobby. Today we are offering over 450 games from Providers such as NetEntertainment, Microgaming, Nyx, GTS and many more. We have also many times added games upon requests from our players. Tell me a little bit about your Live Dealer setup? We are currently offering the full portfolio of Evolution Gaming, the world leader video-streamed live dealer gaming. We offer Roulette (French, European, Immersive & Auto), blackjack, baccarat and Casino Hold’em with the full bet range, both for recreational players and also for players who likes to bet big. You guys have focussed a lot on your Live Dealer tables, is this the way that you see online casino gaming going? Live Dealer tables is “as it real as it gets”, where a player can experience the joy of playing casino games with a real dealer, in the comfort of his own home. Thrills is all about player experience and for us the Live Casino is a big part when trying to build the most stylish and user-friendly Casino on the market. What about mobile live dealer? Already some online casinos are pushing into this territory? We are working together with our partner to get the Mobile Live Casino games up and running on Thrills. Players will be able to enjoy Live games on the fly in the coming months. Editors Note: Since this interview Thrills has launched their mobile live dealer casino. Are there any other trends in the industry that you think will continue to grow? We believe players want to be able to interact with each other where they can share their wins and success stories. The link between social gaming and casino gaming is as strong as ever and we are constantly evolving our “gamification” features on the Thrills site. You guys are licenced and regulated in both Malta and England? Why is this the case? We started out with a Maltese license to be able to cater for Online gambling within the European Union. MGA is one of the biggest licensing authorities with vast experience in the industry ensuring the player’s interests are always as the key focus. With the change of legislation in the UK we decided to opt for a UK license to be able to continue offering our product to UK players. Is the fact that you’re regulated in England a big drawcard for players? For a long time the lack of regulation stopped people from gambling on the Web? Us being licensed in the UK only affect UK players, with the benefit that they now have a local licensing authority. We are happy that the UK Gambling Commission is now up and running as this will add to the trust. What kinds of safety precautions does Thrills have in place to keep players information and money safe? We are abiding by the guidelines and procedures required by the licensing to ensure player personal data is kept safe and it’s not leaving the organization. Customer funds are kept in accounts separate from business accounts; and arrangements have been made to ensure assets in the customer accounts are distributed to customers in the event of insolvency. Why should Australians bet at Thrills, rather than another casino out there? I believe we are offering something different and yet familiar at the same time. Our Australian players can still enjoy the classic Microgaming games like Immortal Romance and Thunderstruck II that they are used to, and at the same time dip in to the all the other amazing games that are out there – all in one place. This together with, in our eyes, a very cool and fresh design and functionality. We also of course offer play in AUD and have all the popular payment processing and withdrawal offers, and players will also notice how fast their money will hit their accounts once they hit that big win. The house edge is smaller online? Is this fact or fiction? This is actually true. Of course it varies between different games and game providers. But on average the house edge is smaller at the online casinos. This is also information we are very open with, if a player wants to know the house edge for any specific game, all they need to do is ask. What are some of the biggest wins players have had at Thrills? Particularly Australian players? We have many big jackpot games where jackpots can reach into double digits millions of AUD, unfortunately we haven’t had a lucky Aussie grabbing one of those yet, but we are sure it will come. Maybe not the biggest win but one of my favourite winner stories was a lucky Aussie who after receiving 25 free spins managed to get a 5 Wild Pay line in the bonus round of the game “Dead or Alive” that netted him almost AUD $8000, and since our free spins are always without wager requirement he could cash it out straight away. What sort of plans do you guys have in the pipelines? We just launched a huge upgrade and rebranding of the site, where we made it faster, better and much more fun. We added a very cool feature called the “Bonus-O-Meter” that automatically awards players great gifts when they hit specific wins, such as the bonus round in a specific game etc. We are constantly developing new things like this so there will be more and more innovative functions built in.